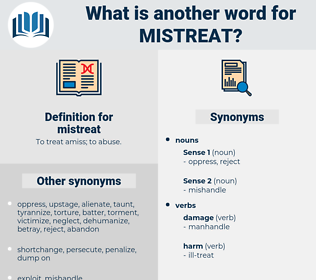 What is another word for mistreat? 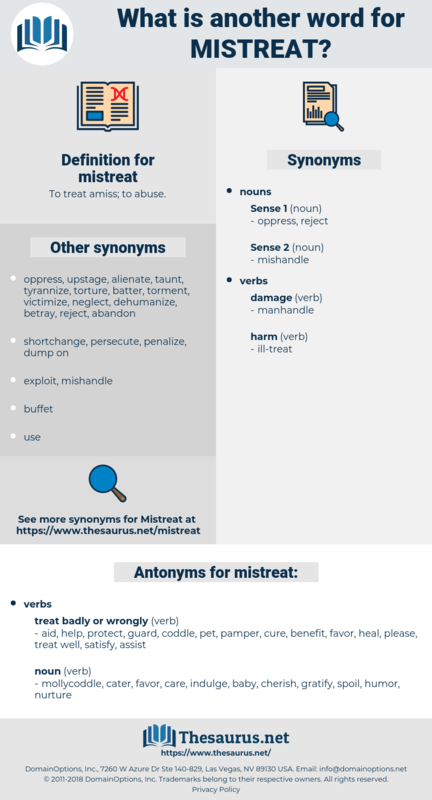 To treat amiss; to abuse. heal, satisfy, assist, pamper, protect, please, benefit, pet, treat well, guard, cure, coddle, help, aid. mollycoddle, cater, favor, care, indulge, baby, cherish, gratify, spoil, humor, nurture. mustard, micturate, masterwort, mastered, megatheriidae, Menai Strait, menstruate, mistreated, magistrate, main street, muster out, monounsaturated, megatheriid.